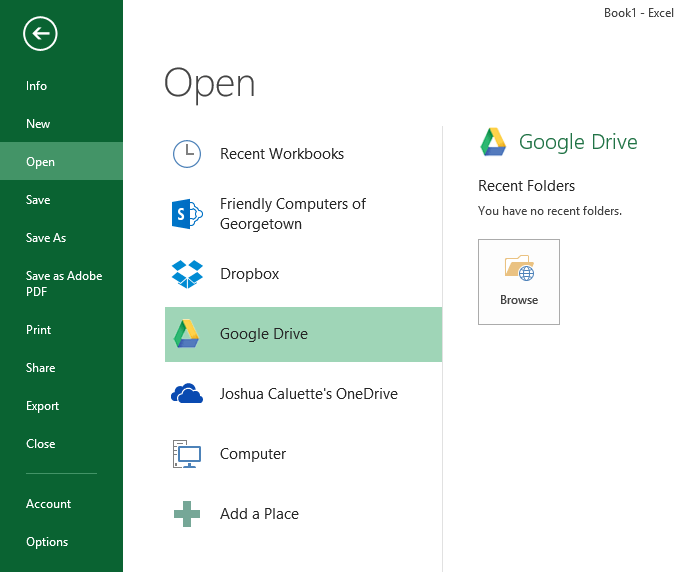 I had a customer ask me today about having Dropbox show up on the Open and Save As menu in Office 2013 applications. You can sign into your OneDrive (formerly SkyDrive) account and then OneDrive appears here, but there are no built-in options for any other cloud services. So I did a little bit of research this evening and quickly happened up on this article. It actually provides a batch script that you can execute on your computer (one for Google Drive and one for Dropbox separately) and ultimately install these services in your copy of Office 2013. The script that the site provides does not include Windows 8.1 (Windows ver. 6.3) in it’s OS check, so I modified the batch script to do so, as the registry keys that are modified are the same between 8 and 8.1. I have included links to my version of the batch scripts. Other than the Windows 8.1 check, I made no modifications to the scripts. Click about a 1/2 inch to the right of Dropbox inside of this address bar. It will suddenly transition to a normal textbox with the full (and real) path of your Dropbox folder. This is usually going to be something like: C:\Users\Josh\Dropbox. Press enter after entering the path exactly as it should be. If you don’t see any errors, then you should be good to go. Open up an Office 2013 program, go to File, Save As and click on Add a Place. You should now see Dropbox as an option to add to your list of cloud places. Follow this same outline for Google Drive, just replace Dropbox with Google Drive, of course. And now, here are the two batch script files. If you receive any security warnings from your browser or antivirus software, you can ignore/allow the script. It is safe.